From our Best-in-Class Countertop Home Water Distillers, this model has a White Baked-Enamel Metal main body and 4 Litre Break-Resistant, Food Grade, (BPA FREE), Polypropylene Carafe. Now with H2o Labs EXCLUSIVE Activated Carbon Pods that last twice as long and contain 3 TIMES the filtering media, specifically designed to provide the purest water and the most effective VOC removal of any similar distiller. This "Best in Class" Countertop Home Water Distiller comes with a Four Litre, Break-Resistant, Food-Grade, (BPA-Free), Polypropylene Collection/Serving Pitcher, (Carafe). It is a very dependable H2o Labs water distiller with a White Baked-Enamel Metal main body exterior and a High Quality 100% Stainless Steel interior steam chamber and condensing coil; and also features single-button start, automatically turns off, and is very easy to clean. 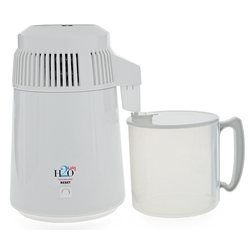 Our "Best in Class" Models 100E, 100SSE, 300E and 300SSE are identical except for your choice of exterior, White Baked-Enamel metal or Stainless Steel; and the Collection/Serving pitcher, which is Break-Resistant Food-Grade BPA-Free Polypropylene with the Model 100E and 100SSE; or a specially designed Glass Carafe and glass nozzle insert with the Model 300E and 300SSE. Other than those variations, Models 100E, 100SSE, 300E and 300SSE all share the same top quality features of our tried and true system that has been sold to thousands of satisfied customers. Top Quality: The entire Steam Chamber including Dome and Condensing Coil is 100% Stainless Steel, Grade 304, (also known as 18/8), the most widely used and versatile of all the stainless grades. All plastics used are Food-Safe and BPA-Free. (NO POLYCARBONATE COLLECTION CONTAINER or other parts that may touch the water.) Metal main body exterior. Most other makes are plastic. Includes a one year supply of H2o Labs EXCLUSIVE Activated Carbon Pods that last twice as long and contain 3 TIMES the filtering media, specifically designed to provide the purest water and the most effective VOC removal of any similar distiller. Optimal size 565 Watt heating element. Bigger is NOT better. Larger heating elements in four litre units can cause water to mix with VOCs and other contaminates. Many manufacturers use a “splash shield” with a larger heating element which is ineffective in preventing contamination. Best Value: More economical by far. Some four litre units can cost twice as much and aren't as good. Other makes can cost less initially, but end up costing much more due to poor quality and repair issues. High Efficiency: Can make up to 16 litres per day. Space Saving, Durable & Portable: At under 4 Kg you can easily take it with you on vacations or travels! White Baked-Enamel steel exterior model matches other white kitchen appliances. FULL ONE YEAR WARRANTY PERIOD covers ALL parts and labour (2 and 3 year extended warranties are also available.) LIFETIME Full Value Trade-in GUARANTEE when you want to move up from you H2oLabs 4 Litre unit to a higher capacity distillation system with convenient storage tank.